There are times I wish I didn’t love to bake. 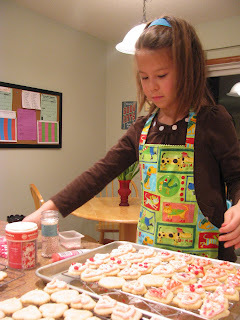 Monday night, I had the worst craving for simple sugar cookies with butter frosting. I self-diagnosed this after scrounging in my kitchen for 15 minutes after the kids were in bed, looking for something to satisfy my sweet tooth, and finding nothing. Leftover Halloween candy? No. (And oh yes – we still have tons. Help me.) Dark chocolate almonds with sea salt and turbinado sugar? Nope. The remaining Peppermint Jo-Jos? I was burnt out. But sugar cookies? Sweet, simple, buttery, fresh sugar cookies? Frosted with a mound of pink, velvety frosting and maybe a few sprinkles? Oh. My mouth watered at the very thought. 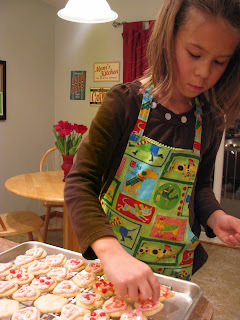 Thankfully, I have a eight-year-old daughter who loves to bake as much as I – and who decorates with flair. Thus, my counters looked like this tonight. Give or take five of those delectable little hearts. Yuuuum. Those looks delicious. 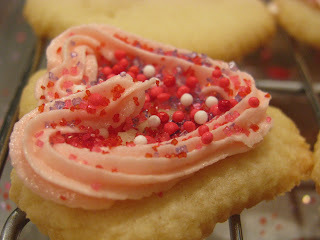 I have such a soft spot for sugar cookies, especially with copious amounts of frosting. ps - LOVE LOVE LOVE the new blog design!! And one of these Sundays I actually want to meet you! I ( so very thankfully) am not much of a cookie girl. I can bake em and just leave em. On the other hand I am thinking of making a trek to Minnesota to get those neglected almonds. Dark chocolate, almonds and sea salt? Be still my beating heart. That girlie of yours looks utterly adorable in her earnest concentration on her masterpieces. I know those. Send some my way please! Your baking is dangerous to the rest of us too--creating cravings & arousing envy! I have a birthday cake to make for 2nd son tomorrow. I wonder if he would be persuaded to have pink sugar cookies instead? Oh my word. Those look amazing. Now I must make some sugar cookies very soon! Those are beautiful, but I'd rather have them plain without the icing! Sure, I'll come over for cookies and coffee! Now I want some cookies. My sweet tooth has gone into overdrive with my current pregnancy. I've been doing a lot of baking. I think I'll be making caramel rice krispie treats tonight. 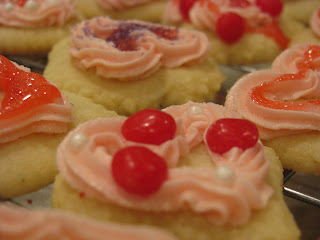 Wow, those cookies look yummy and artfully in focus. Did you get a new camera? 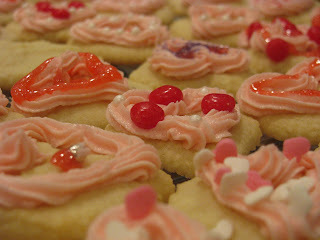 We made similar goodies last night, though I tried a new frosting and it wasn't nearly as good as my butter frosting.